Chinnor hill is a local hill I use for hill climb training. It’s roughly 1 mile long, averaging 7-8%. In the middle section it is fairly steep at around 15% and a tight mini-hairpin halfway up where you turn left. Chinnor Hill in winter. This is the mini-hairpin and will make a good point to watch the race. It is a gradual ascent as you leave the town of Chinnor. I usually start an effort just after the railway bridge and beyond the new mini roundabout. This makes it a classic hill climb length of 0.8 miles and this is the steepest section of the hill. The gradient never gets really steep, and is fairly consistent. But you will be out of the saddle on the steepest part. The climb is covered by trees and so the road is often shady and damp. 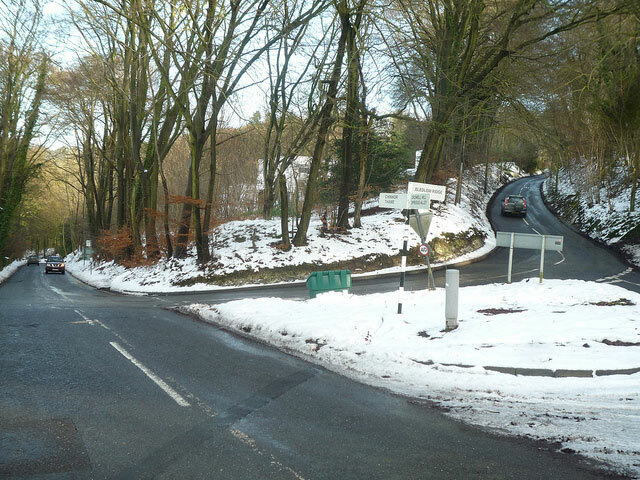 It is a reasonable approximation to Pea Royd Lane and many other hill climbs. It reminds me a bit of Nick O Pendle because the gradient is fairly constant. From the top of Chinnor Hill, you can go left back down Bledlow Ridge towards Princes Risborough. If you go straight on, you head in the direction of West Wycombe. Whichever way you go there’s plenty of more hills to have a go at. Today, I did five hard intervals up Chinnor hill, with fairly short recovery in between. It’s like doing a 25 mile TT you get a lot of acidosis in the system and a feeling of sickness / nausea. The first interval is always the fastest. But, the second fastest was the fourth. Because the third I had so much acidosis I couldn’t get going. I took a little longer recovery and then did better than 2nd or 3rd. There are benefits to both short recovery and long recovery. Long recovery enable you to go faster. This kind of session must be really good for 25 mile TT training. Shortly after Chinnor Hill, the route goes to Princes Risborough and up Kop Hill – to reach the top of Whiteleaf Hill. Chinnor Hill will be a good place to watch. The road is wider than Kop hill and at the steep part, the peleton should be slowed down quite a bit. It’s pretty cool the Tour of Britain is coming to Chinnor Hill – especially after ascending the A40 climb (Aston Hill) to Stokenchurch and descending down Kingston Hill. I’ve used that combination of hill so often in training. It’s excellent territory around the Chiltern ridge if you’re looking for 4-5 minute steady climb. Thank you for the write up Tejvan, i didnt know the tour was coming though Chinnor, how cool. What a great chance to see the pros on a local route. Great website. loving the hill reviews. I was not awareof Chinnor hill or – the other one you mention up to Stokenchurch. I usually am coming from Marlow so dropping down into Watlington – but will look to head north a little for my next route.